Central Coast-June 30, 2011 marked the "Grand Finale Event" for the 2011 Home Builders Association of the Central Coast (HBACC) Tool Drive which raised close to $2000 in cash and tools for industry partners Habitat for Humanity and People's Self Help Housing. A special "thank you" goes out to Hayward Lumber which helped host the last event of the Tool Drive. and Sheryl Flores pose with some of the tools donated. "Our mission is with HBACC is that we work to provide quality housing and communities for the Central Coast," said Shawn Reed, this year's HBACC President " and part of that includes collaborating with local non-profits which benefit our community." Over the years, the HBACC has worked to support local charities which promote urban enhancement and quality of life, through food, blood, and toy drives for the needy. Their most recent initiative, the 2011 HBACC Tool Drive, was organized to provide tools and supplies for People's Self Help Housing and Habitat for Humanity. Since both organizations generate little to no income from the affordable housing they provide to low-income individuals and families, funds for supplies are limited. As the Executive Director of Habitat for Humanity, Julia Ogden, puts it, "Every tool donated means that the money we would have spent for tools will go toward much needed repairs for these families." Rather than purchasing a hammer or tool belt, Habitat for Humanity and People's Self Help Housing can spend those funds on lumber, paint or subsidizing their core programs. "Peoples' Self-Help Housing (PSHH) and the clients it serves are grateful for the generous support provided by the members of the Home Builder's Association of the Central Coast," commented Sheryl Flores, the Homeownership Development Manager for Peoples Self Help. "The tools donated by the Association will be used by the families who qualify to build their homes through Peoples' Self-Help Home Program and by the community members who volunteer to help these hard-working low-income persons construct their homes." stand with tools in front of one of the SLO Habitat homes. The response was overwhelming as more than $850 worth of tools and $1125 in cash to purchase tools were graciously contributed by business and individual members of the Home Builders Association. 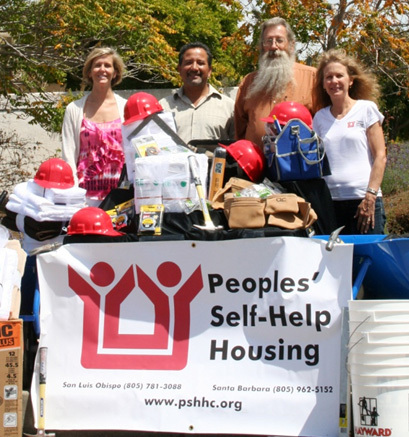 Founded in 1970, Peoples' Self-Help Housing has developed 1,150 self-help home ownership residences and over 1,350 affordable rental units in San Luis Obispo, Santa Barbara, and Ventura counties. For 40 years, the non-profit organization has not only developed affordable housing in over 30 cities and communities but has also provided community facilities, supportive housing programs, financial education, and youth after-school education--programs that foster greater self-sufficiency for low-income households, seniors, the formerly homeless, and special needs households. For more information contact Sheryl Flores, PSHH Homeownership Development Division Manager, at (805) 783-4465. From Sheryl Flores: "Peoples' Self-Help Housing (PSHH) and the clients it serves are grateful for the generous support provided by the members of the Home Builder's Association of the Central Coast. The tools donated by the Association will be used by the families who qualify to build their homes through Peoples' Self-Help Home Program and by the community members who volunteer to help these hard-working low-income persons construct their homes. Currently, 29 families are building their homes in Templeton. Fifty-eight more low-income households will soon start construction their homes in Nipomo and Atascadero. In addition to the tools, bedding and linens were donated to help the approximately 40 individuals and families who move into Peoples' affordable rental apartments who have been temporarily homeless and do not have bedding." Using volunteer labor and tax-deductible donations of money and materials, Habitat for Humanity builds and rehabilitates homes with the help of future homeowners. Houses are sold to low-income families through affordable, no-interest mortgages. Mortgages are issued over a fixed period (usually 20- 30 years.) Monthly mortgage payments are used to support the construction of more houses. For more information, contact Habitat for Humanity's San Luis Obispo location at (805) 782-0687. From Julia Ogden : "Habitat for Humanity for San Luis Obispo County truly appreciates the support we have received from the tool donation sponsored by the Home Builders Association of the Central Coast. The tools we received will be used not only on our future home builds, but also as part of the launch of our Brush With Kindness program this fall. Through BWK we will be refurbishing and doing minor repairs on homes owned by low-income families who are unable to afford the home's maintenance. Every tool donated means that the money we would have spent for tools will go toward much needed repairs for these families. The HBA's support will ensure that we will be able to serve more families!" More information about People's Self Help Housing visit their site at www.pshhc.org and Habitat for Humanity at www.hfhsloco.org.